for $269,900 with 3 bedrooms and 3 full baths. This 3,152 square foot home was built in 2001 on a lot size of 2.5 Acre(s). Entering the front door, you are met with a beautiful hardwood staircase and a massive stone fireplace reaching 2 stories. Main level hosts an expansive living room with stone fireplace as the focal point. Formal dining room displays windowed cantilevered bump-out and both areas have gorgeous hickory flooring. Eat-in kitchen features hickory cabinets, solid surface counter tops, center island, double wall ovens, glass cook top, ceramic tile flooring, side by side refrigerator and the kitchen appliances stay. Just off the kitchen is a large pantry. The main level full bath boasts a pedestal sink, jetted tub and ceramic tile flooring. There is an office/study with closet too. Beautiful hardwood staircase leads to the second level. All bedrooms have multiple windows for abundant natural lighting and spacious closets. Front bedroom has his and hers closets. Bathroom has double vanity sinks and a pocket door to separate the tub/shower toilet area. Huge laundry room offers additional storage. There is a central vacuum system for ease of cleaning. Each level has its own heat pump for comfort. There is a huge partially cover back patio and home has a nice wraparound porch. Great oversized 2 car garage with separate workshop, bonus room, full bath and its own HVAC. Durable concrete driveway. Some square footage is from bonus room over garage. 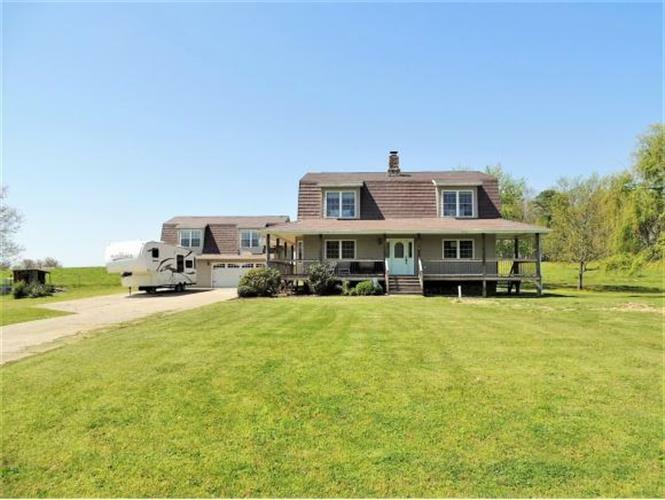 Property consists of approximately 2.5 acres. Living room curtains, dining room curtains and sliding glass door curtains do not convey. Information herein is deemed reliable but not guaranteed.